Home Cooking on the Allotment The most delicious tarte ever! The most delicious tarte ever! When my Dad found these little juicy plums whilst walking the dog I instantly turned to the ever so brilliant book by Alys Fowler called ‘the thrifty forager’. 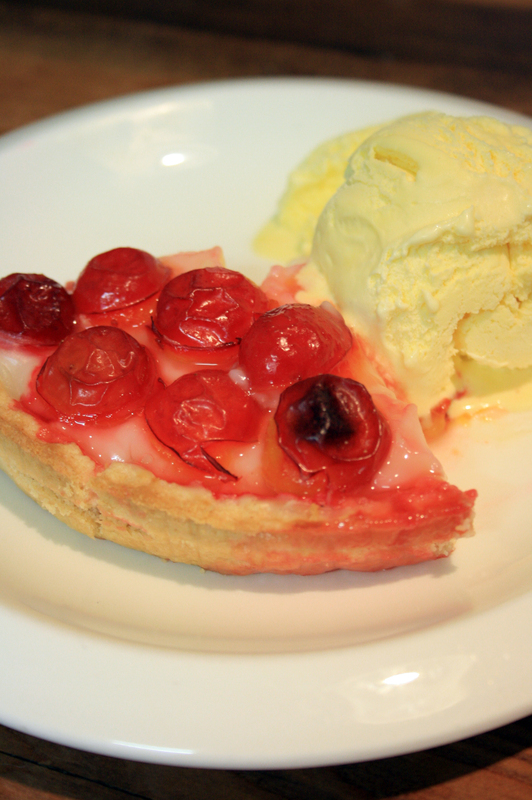 She confirmed that they were indeed cherry plums and was so kind as to share a tarte recipe on the opposite page. How could I ignore that, especially when it looked so delicious?! The recipe included a homemade pastry tart case, however I cheated and brought a sweet pastry case from the supermarket to save a bit of time. So here’s the recipe for the most delicious tarte in the whole world! Heat the Milk in a saucepan, do not let it boil. In a bowl mix together the sugar with the 2 yolks until it becomes smooth and shiny. Add the cornflower and stir well. Lower the heat on the milk and add the sugary egg mixture, stirring constantly. It usually takes around 15 minutes for the creme to cook. It should become stiff and come away from the sides of the pan. Let it cool in the saucepan off the heat. Cover the pan with cling film to stop the creme drying up. Wash the plums, half them and remove the stones. 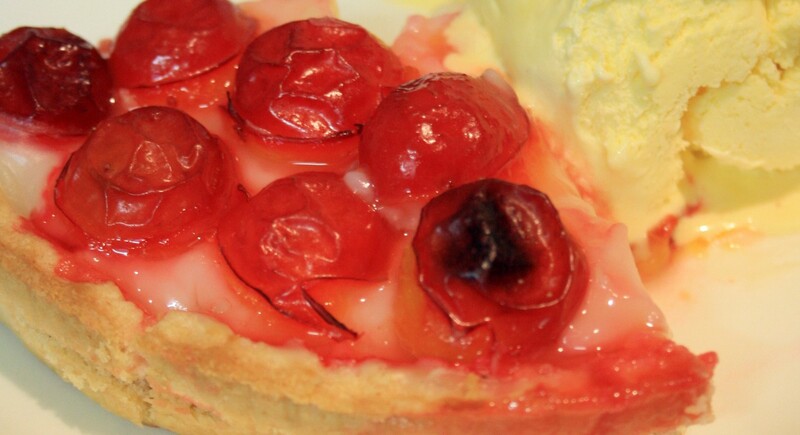 Spread the creme over the pastry and cover neatly with plums. Bake the tart at 180C for 15-20 minutes – the plums will become soft and slightly caramelised. Yummi…! Now I need to sneak my way into my neighbors hedge and help myself to some juicy plums. Well, maybe I should ask for them and invite her in for tea and tarte. Thanks for sharing. Went on an impromptu forage this morning, I’ve left you a present on your gate. That’s kind of you, I’ll pick it up when I’m passing sometime this week. Thanks, picked up this morning. Check under your shed behind your watering can. Anyway, thanks for sharing this info; As I do lots of foraging here, I wonder if the book will be useful to me! Any idea? Hello! Aly’s doesnt have a cook book but in her foraging book she has a few recipes dotted around 🙂 I loved her edible garden programme too!